It's A Family Adventure! : Our Review of the Cbeebies Magazine! Nowadays, with all the apps available online, and the huge range of children's channels available on TV, it has become common place to allow your children to sit on the sofa, lie in bed, or even sit at the table during mealtimes to watch their favourite shows or play their chosen fun games. Whilst some of these can still be very educational for a child and also a great tool for when you need 5 minutes to yourself, I personally really enjoy getting my children to do fun activities that stretch the imagination, and encourage them to read, get creative, and enjoy being active. 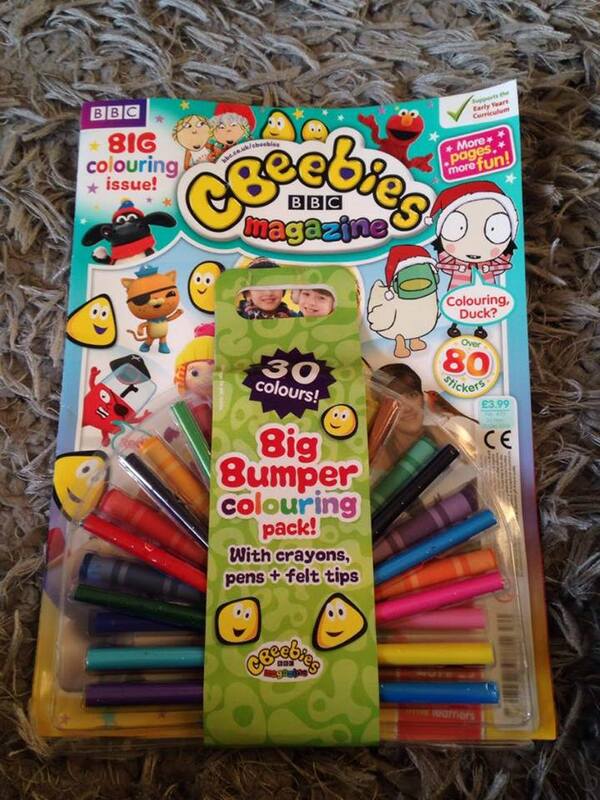 Riley and I were therefore really pleased to receive a copy of Cbeebies magazine, which was absolutely jam packed full with 43 pages of fun activities, and stories for him to enjoy. 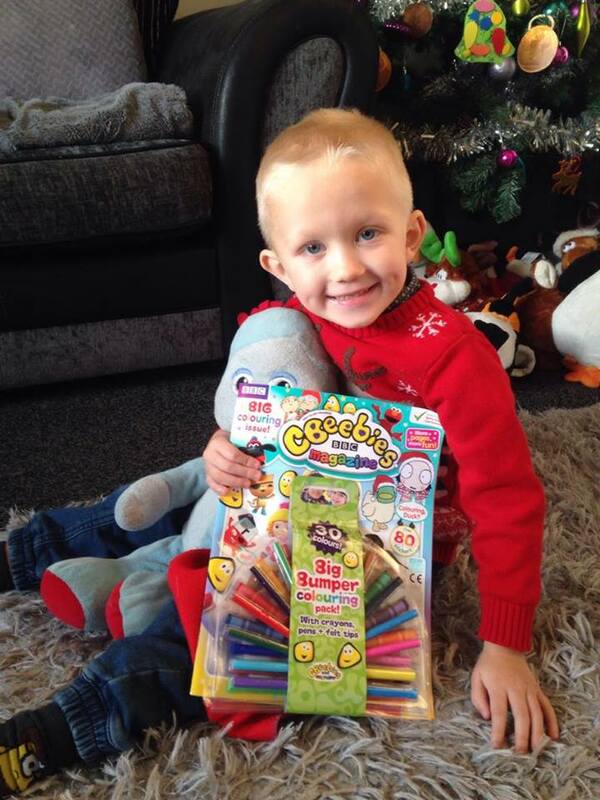 He was even more thrilled when he realised that the magazine also came with a bumper selection of colouring tools including pencils, crayons and felt tip pens. 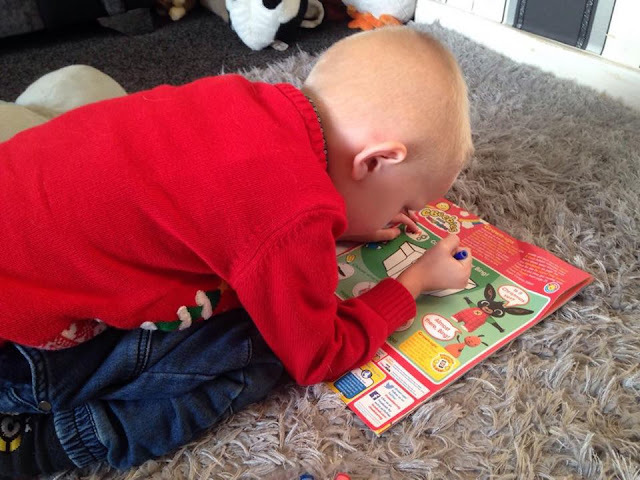 We received edition no 470 which was described on the front page as a BIG colouring issue, and they weren't wrong with plenty of colouring pages inside to keep Riley entertained. 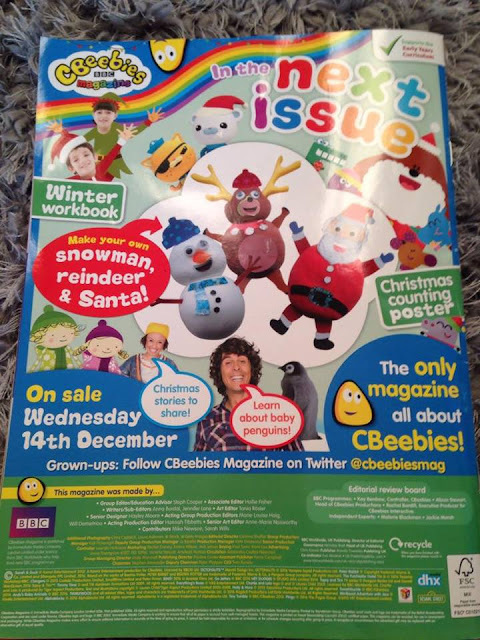 The front cover had a wintry theme and featured a whole host of popular Cbeebies characters. Riley enjoyed naming all the stars on the front, before he decided to have a quick scan through the magazine and see what was inside. 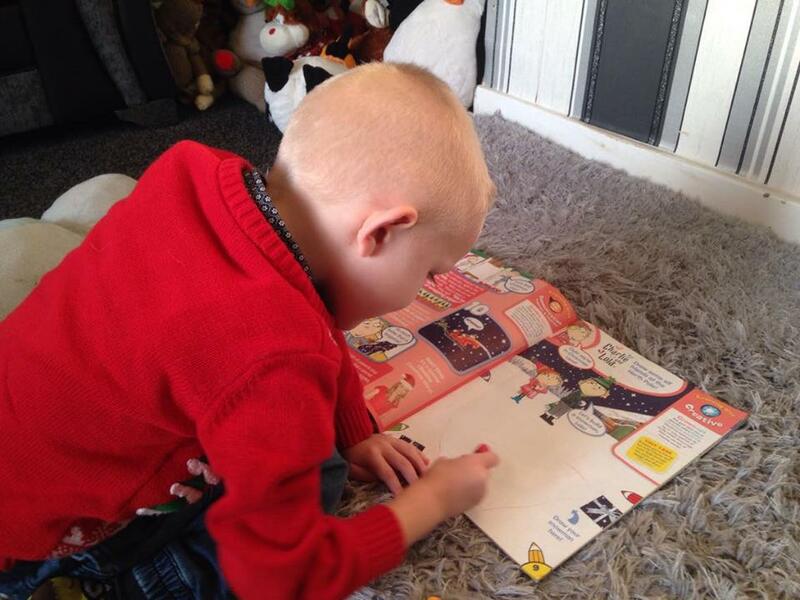 I was pleased with how many colouring pages there were, as he absolutely loves art (just like his sister). 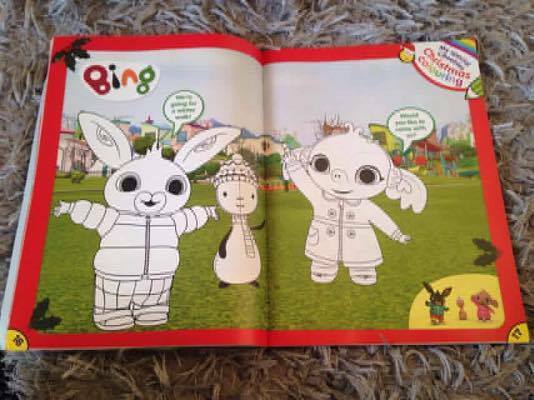 His favourite was the big picture of Bing, Flop and Sula. On the first inside page, there is a great guide for grown ups, which explains the 6 areas of learning which support early years development, as well as an introduction from the editor informing you what is inside and on which pages you can find certain activities. My son decided that working through the pages in order wasn't for him, and so we just read through it at a pace which suited him, and then worked on whichever activity he chose to do in no particular order. The whole magazine is really eye catching and colourful which is great for kids to help keep their attention and interest. On each page, there is again a section for grown ups with suggestions for further activities to follow on from what they have just read or drawn which is a great idea. There was a bedtime story inside based on the clangers, which was great for when we wanted to have some quiet time too as we were able to read the story in the afternoon just after lunch, and again before bedtime, which meant that the magazine was getting plenty of use throughout the day. In the centre of the magazine, there was a selection of stickers. Unfortunately my son doesn't like to follow any particular rule with where stickers should go, and just likes to stick them anywhere within the magazine. This was ok with me though as he was happy and enjoying sticking them wherever he liked, so as he was having fun, I didn't try and make him stick them in the correct places, and the majority of the activities could still be enjoyed without them. I liked the Peter Rabbit workbook section which helped Riley to learn more about letters and how to write them by following over the printed letters with a pen, along with a matching game and a sticker activity. There was a competition too for the chance to win a Talking Ubercorn and Vroomster toys and it was nice to see an opportunity for children to win such a lovely prize. We had an enjoyable time reading through the magazine and enjoyed the activities together. I noticed that two of the pages within the magazine were taken up by full page advertisements which isn't too excessive compared to other publications. The rear page also advertised the next issue of the magazine which includes a Winter Workbook and shows you how to make your own snowman, reindeer and Santa. This edition is available now from all good newsagents and is priced at £3.99. Disclaimer: I was provided with a complimentary copy of the magazine for the purpose of providing on honest and impartial review. All opinions are my own.